A Merry Christmas and Happy New Year to you and your families! The Board of Directors, Executive Director Karen Garnett, and all of the CPLC staff thank you for all you do for Life. As we look forward to a new year, we are busily preparing for the Diocesan Roe Memorial Events on Saturday, January 21, 2012 commemorating the U.S. Supreme Court decision making abortion available on demand throughout America and leading to the death of over 52 million unborn children since 1973.
in which Jesus tells us that He came so that we all might have life and have it in abundance. As Cardinal DiNardo reminded us during this year’s Respect Life Month, “Jesus’ promise of ‘life to the full’ is especially poignant today, when our culture and sometimes our government promote values inimical to the happiness and true good of individuals and society.” There is no starker reality of this great harm to the common good than the legalized killing of God’s precious children in the womb for nearly four decades. 10:00 am: Bilingual Roe Memorial Mass at the Cathedral Shrine of the Virgin of Guadalupe, 2215 Ross Ave. at Pearl St., Dallas, concelebrated by Bishops Farrell, Vann, Deshotel & Seitz and diocesan clergy, with homilist Fr. Jason Cargo and music led by Curtis Stephan! We look forward to praying and marching with all of you, as we not only remember the lives lost, but also witness to the amazing victories for life won through God’s abundant grace! As we mark the anniversary of Roe this month, we are also thrilled to announce the upcoming release of two pro-life films: Doonby about a mysterious drifter who embodies the message: "Every story's worth telling. Every life's worth living," and October Baby, which chronicles the journey of a young woman who survived a failed abortion. A private pre-screening of October Baby for pro-life leaders will be held on January 19 at AMC North Park in Dallas, followed by a February 9 screening at Tinseltown Plano. We will send each of you an invitation by email with additional details soon. Our next Quarterly Parish Pro-Life Coordinators Meeting will be Saturday, February 11, 2012, at St. Michael the Archangel, 2910 Corn Valley Road, Grand Prairie, 75052, from 9:00 a.m. to 12:00 noon. 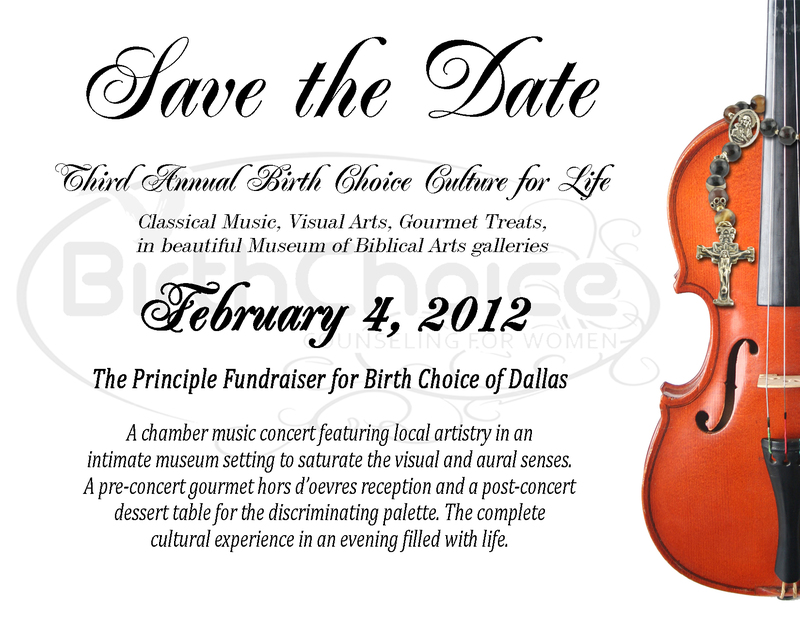 Come and meet your fellow Parish Pro-Life Coordinators, CPLC Ministry Directors, volunteers and staff, and learn about what we have in store for 2012! Finally, I'd like to extend a special thank you to all the parishes that participated in the National Night of Prayer for Life, including Holy Spirit, Duncanville; Immaculate Conception, Grand Prairie; Mary Immaculate, Farmers Branch; Mater Dei, Irving; St. Gabriel the Archangel, McKinney; St. Jude, Allen; St. Joseph, Richardson; and St. Philip the Apostle, Dallas. This month, Immaculate Conception is recognized in our Parish Spotlight for its unique celebration of life with a banner on the alter, impressing on all present the importance of respecting the sanctity of life (photo). Please let us know what your parish is doing for the Cause of Life, so we can be sure to shed the spotlight on all your great work! We at the CPLC have a lot for which to be thankful as we ring in a new year. If you missed it, be sure to check out the 11 Reasons to Celebrate 2011. And please join us in prayer that the Lord continues to bless the work being done by so many to bring an end to abortion in our city in 2012!